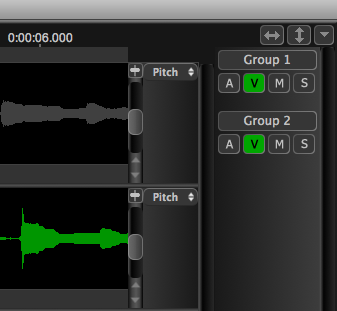 The group controls are shown at the rightmost side of the main Revoice Pro window. You can show or hide this column by pressing the rightmost arrow button at the top of the column. You will see four buttons for each group, A, V, M, S.
When the button is green that function is "on". These are not duplicated by keys on your computer keyboard. Pressing any of these group controls for a group will affect all the tracks in that group. Similarly, pressing M or S on the left-hand track controls of any track in an active group will affect all the tracks in the group. When you activate a group by pressing A in that group's controls, the button lights up with the colour of the group (the colour is selected in the Manage Groups function described at the start of this section), and (as long as they are visible) the tracks in that group show a vertical bar of that colour down the left side of the Revoice Pro window. In this example, Group 1 is red and affects the first two tracks, while Group 2 is green and affects track 3. 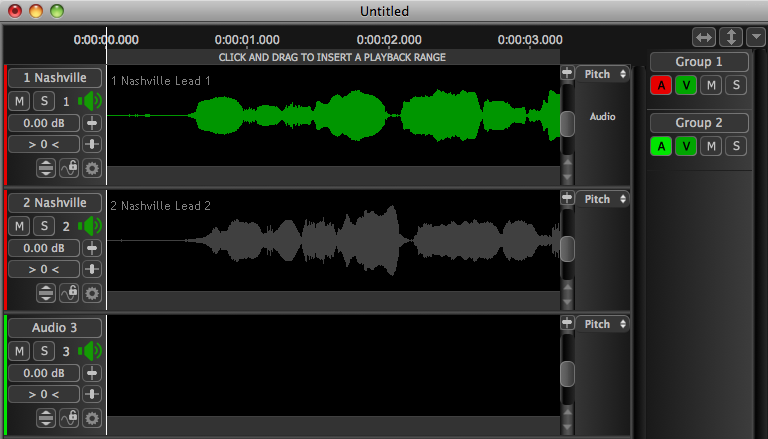 Tracks in a group can be made visible or invisible by pressing the V control. ALT V is an exclusive visibility control, which makes only that group of tracks visible. Because tracks can be assigned to more than one group, sometimes a function will affect tracks in multiple groups at the same time. If all the tracks in a group are affected by a function then the group control for that function will be affected too. So, for example, if group 2 contains all the tracks that are also in group 1, muting group 2 will also cause group 1's mute button to go red.